It is indeed an honour to be able to bring the greatest player to a technology savvy generation of fans in what promises to be the greatest cricket game of all time! 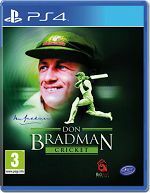 The Legend continues ... Sir Don Bradman, a revolution in Cricket and now an evolution in gaming. Unique batting and bowling controls: Giving full 360 shot control and Line and Length delivery. Intuitive controls that allow for line and length deliveries without pitch markers and realistic shot control when batting. 20 Years career mode: Take a 16 year old aspiring cricketer through the ranks to International glory. A fully featured fielding system: That allows you to run down the ball and slide to prevent a Four, catch a high ball on the boundary rope, or knock down the stumps to take a vital run out. Manual appeal and electronic review system: Allowing for the first time challenges of the umpires decision. Dynamic time of day: Weather system and pitch degradiation: That are based on real world data. Don Bradmany Academy: Where you can create / Edit / share online Players, Teams, Competitions, Tours, Umpires and ready to download made by other users and use them in game. An online save system: That lets you continue your match whenever you want with online opponents. Practive in nets or match practice: Hone your skills to perfection before taking to the field. Realistic ball physics:The most realistic physics ever seen in a cricket game, including thin edges, bat pad catches, intimidating bouncers and much more. A complete player physics system: with individual attributes including weight and height along with Identity, Appearance, Fielding/Batting Kit.